Hong Kong was the destination for my first ever trip to Asia back in 1997, and it was unlike anywhere else I’d ever been – so exotic and exciting, with new sights and sounds on every street corner. At the time I didn’t think I’d ever have the chance to come back again, but as it is, this trip was my third visit to the city, so never say never! And I don’t often like to revisit places I’ve already been. I find that when things change as they inevitably do with time, that it can tarnish the memory and not live up to the expectation, but Hong Kong… Hong Kong is different. Hong Kong is a place I think I could keep on going back again and again to, and each time discover something new, there’s just so much to see and do. What a city. And as the first place I visited on my own, it’s always had a special place in my heart. My brother had moved to the city in 1996 and in July 1997, with the Hong Kong handover of sovereignty from the British back to the China coming up I decided to pay him a visit en-route to my first ever solo trip in Thailand. So here I found myself again, 20 years later! With my brother having recently moved back to the city, I decided it was time to take a trip to visit him again, this time, along with my husband and two year old son. I don’t even know where to start it’s just such a vibrant and colourful city to explore. Everywhere you turn there is something to look at, there’s just so much going on around you and so many different aspects of life all around. And the food… Hong Kong is famous for good food, and dim sum is the done thing. It’s easy to find good food for all price ranges all over the city. We stayed on Hong Kong Island as that’s where most of the action is at, and checked into the Island Shangri-La. One thing to note is that Hong Kong is very expensive for accommodation, though it’s really worth spending a bit more to stay in a central and well-connected area, especially if you’re travelling with kids. The Island Shangri-La was perfect for us with all the home comforts we need and the hotel is perfectly located a short walk from Admiralty MTR station which connects easily with just about everywhere. And check out the view above from our room at the hotel! We opted for a Peak view room, but you can also pay extra for a view of the harbour. We decided not to bother since given the fact you spend more time on holiday out of the room than in it, it’s not really worth it. There are plenty of places to soak up the harbour views from around the city, so it’s not like you’re missing out. After spending our first afternoon off the plane relaxing in Hong Kong park and catching up with my brother, we set out the next day to take a walk around Old Town Central and explore the areas around Hollywood Road. There is so much to see and do here, and the Hong Kong tourism board have a range of excellent free walking tours that you can download and follow, tailored according to your own interests. We started at Pottinger Street, famous as a bit of a curiousity for how the slabs are laid. With Hong Kong being such a steep hilly place, laying the stone in this fashion made it easier for walking on, and for rainwater to flow down. Traditionally a market street, there are still a few stalls on the lower end of the street, mostly selling souvenirs. One of the well-known places to visit in the city is Man-Mo Temple on Hollywood Rd. Estimated to have been built in the mid 1800s, aside from anything else it’s pretty interesting to see how the high-rise city has built up around it, leaving it dwarfed in comparison. After so much walking around in the morning for the afternoon we decided to do some sightseeing by the city’s famous trams. And although you can just hop on any trams that run through the island to get from one point to another, we decided to try out the Tramoramic Tour so we could just sit back and enjoy, and hear the tales and history of the city from the onboard guide. The tour runs from the Western Market tram terminus all the way through the city to the Causeway Bay terminus and takes about an hour to complete. We found it to be a welcome break from the walking (especially as it gets very hot and humid in July), and we learned some interesting facts about the city along the way. It’s also a great way to get a look at the city from above street level and to admire not only the height and style of the surrounding buildings, but also the juxtaposition of old and new at such close quarters in the city. If you get a clear day too, don’t miss the chance to go up to Victoria Peak and take in the panoramic views across the city from there. The views really are spectacular and there’s no better way to get a feel for what the city is all about. You can take the Peak Tram, not far from Hong Kong park, though it’s best to go early in the day if you want to take this route as on clear and sunny days the queues can easily mean at least an hour long wait for the tram. Public buses also go up to the peak and taxis are cheap in Hong Kong so that’s an easily affordable option too, especially if you’re coming from Hong Kong Island side. There really just is so much to see in Hong Kong, you don’t even necessarily need a guide book. It’s the kind of place that is just great to get lost in and wander around. It’s a safe city too, so there are very few annoyances outside of the occasional pickpocket to worry about. You also can’t miss the Central-Mid-Levels escalator for the curiosity factor. It’s the longest outdoor, covered escalator in the world. It’s also makes life much easier for exploring the hilly Mid-Levels or if you want to get to the top without breaking too much of a sweat! We spent a lazy Sunday wandering around Kowloon. We had hoped to find a Kung-Fu demonstration in Kowloon Park as according to the Leisure and Culture Dept of Hong Kong there are free Kung-Fu demonstrations and lion dances every week on a Sunday. Sadly, we didn’t manage to see any – as there had been a T8 typhoon warning earlier that morning that wasn’t downgraded until later in the afternoon, we can only assume it was cancelled. After a stop at Kowloon Park and a good hour spent at the kid’s playground there, we took a long walk around the Kowloon Streets and to the Avenue of Stars, Hong Kong’s answer to the Hollywood Walk of Fame. Billed on site as Hong Kong’s premier attraction, I’m not sure I’d go that far, but it makes for a pleasant walk and some good photo opportunities amongst the statues. It also leads down towards the Tsim Sha Tsui promenade which is an excellent place to admire Hong Kong Island from. Of course from there, you can’t miss a journey on the Star Ferry back to Hong Kong Island. And if you only take the Star Ferry once, it’s best to do it in this direction, from Kowloon going back to Hong Kong Island to make the most of the view. That said, the view in either direction is pretty impressive! You also can’t miss the markets in Mongkok. It means quite a bit of walking again, but it’s a shoppers paradise, and even if you’re not interested in spending they’re worth a look just in terms of the sights you come across along the streets. Start at the Ladies market and walk through to the Goldfish market, flower market and finally the Bird Garden. Of course no trip to Hong Kong with kids is complete without a trip to Disney. It’s easy to get to as is connected by the rail (MTR) system and takes around 40 minutes to reach from Central on the Island side. Disney was a lot of fun and although it was a far smaller park than I’d expected, the rides were great and there’s a lot for very young children to do. Ocean Park is another well-loved Hong Kong institution for families, and although there are reports of many people preferring this park, it seems to be better geared for families with older kids and teens. Hong Kong itself is actually a territory made up of 268 islands, and Lantau Island is the biggest of those. It’s where the airport is located now, and also renowned for the ‘Big Buddha’, otherwise known as Tian Tan Buddha and Po Lin monastery. 20 years ago I visited Lantau Island by ferry, though most people now tend to use the MTR system which takes them to Tung Chung station and where a nearby cable car takes you straight over to the Ngong Ping Village where the Big Buddha is located. We went mainly because my husband hadn’t been before, but to be honest it has changed a lot in 20 years and this time round I found it to be a bit underwhelming and very touristy. It’s still worth a trip out if you have time though, and the wild cattle are a quirky presence wandering around the area. Just make sure while you’re out that way to venture down to the fishing village of Tai-O – that’s a fascinating little place not to be missed. It’s easy to reach Tai-O from Ngong Ping, you just need to catch a bus from the station which is right next to the tourist village. Everything is pretty clearly marked so it’s really not difficult. Despite this, we decided to visit Lantau on a private tour from Hello Hong Kong Tours who I’d stumbled across on instagram. Travelling with a two year old isn’t always easy, and although I was fairly confident we’d be able to navigate the Big Buddha and Tai-O on our own, we decided to opt for a private tour instead, just to take any hassle out of it. We like not having to think too hard on holiday, and the other advantage to doing a tour is that you get to ask lots of questions, and you invariably see and learn a lot more than if you just wander around on your own. They offer group tours also, but with a newly potty trained toddler we decided we didn’t want to risk holding the group up all day long and opted for the private one. Tai-O is one of the last places it’s still possible to see Hong Kong’s famous endangered pink dolphins (Chinese White Dolphin), which despite only as few as 78 estimated to be remaining back in 2011, incredibly, the government still seems to be doing absolutely nothing to protect. The focus and priority seems to be on the mega road bridge in the area, which will connect Hong Kong with Macau, as seen in the image below. A humble fishing village, basically a squatters village of fishermen with houses built on stilts over the waters, Tai-O is well worth a wander around. It’s another way of life completely, and a bit of a journey back in time to an altogether different era. Tai-O is also famous for its high quality shrimp paste and is one of the few remaining places in the world where they still make it by hand which is interesting to see. If you venture out to take a look at the Hong Kong-Macau road bridge, take a stop by the Hou Wang temple and visit the fortune-teller. Chinese Fortune Sticks, Kau Cim are used to tell your fortune. By shaking the container of sticks in front of the altar you keep in mind the answers you want. The first stick to fall out offers your fortune, and the fortune-teller will decipher what the number on the stick means, in accordance with the answers you have asked for. It was a bit tricky to understand with the language barrier, but certainly a novelty and a bit of fun trying something new. Despite it being my third time in Hong Kong there are still things I would like to see and places of the city I would like to explore further. There really is just so much to see and do and it’s really easy to fill your time here. We stayed for 10 days this time and were exhausted by the end of it from having been constantly on the go! If it’s a city you’ve not been to or are thinking about visiting – just go, you won’t regret it! There’s really something to do for everyone – foodies, history-buffs, would-be explorers, for shopping, for nightlife and so much more. Even though it’s changed a lot in 20 years, the mix of cultures, history and far eastern exotica makes for such a vibrant atmosphere that it’s still a place I would go again and again. If you want to find out what the real magic of Hong Kong is, you just need to go! Hong Kong is just under 9 hours flight time from the UAE. The city is very easy to get around with a vast network of public transport. If you plan to use it a lot, pick up an Octopus Card which you can use across just about everything including trams, buses, ferries and MTR. You can even pay for food and groceries with it in some places! The Octopus Card requires a deposit and comes preloaded with credit that you can top up as needed. The deposit and any remaining credit is refundable when you return the card (minus an admin charge). If you need (or want!) to stay connected throughout your stay, pick up a local SIM card at the airport which will allow you access to the local WIFI all over the city. There are loads of places selling different types of SIM cards at the airport which can be a bit confusing, but go to the 1010 CSL shop and get the Discover Hong Kong tourist package. It’s HK$88 (Dhs41) for 5 days or HK$118 (Dhs55) for 8 days and means all local calls are free to make and includes 1.5Gb/5Gb of 4G data respectively – bargain. I bought the 8 day card and it was awesome – just plug it in and off you go (just remember to carry the little pin for opening the SIM drawer with you…). Hong Kong is not a particularly stroller friendly city owing to all the hills, so plan for this. We took a backpack child carrier which was perfect for keeping the toddler out of the crowds and allowing him to view things from the same height as us which he loved! We went in July which is the hot and rainy season, but despite the T8 typhoon warning on our first day the weather cleared and we saw very little rain. When walking around Hong Kong Island, you’ll also find there is a vast network of covered walkways between buildings and public transport, so even if it does rain, it’s fairly easy to go about your business and keep exploring under cover. Hong Kong does get very sticky and humid though so take light clothes, and comfortable shoes for walking all day in! Little Steps Asia – I stumbled across this one by accident but it has heaps of useful tips on things to do, where to eat, indoor play centres if the weather is bad and heaps more for families. Their 30 Unique things to do with kids in Hong Kong has some excellent suggestions, but the site is a bit of a gem in general. Aimed mainly at expats, the information is still relevant and as such tends towards ideas away from the standard guidebook suggestions. 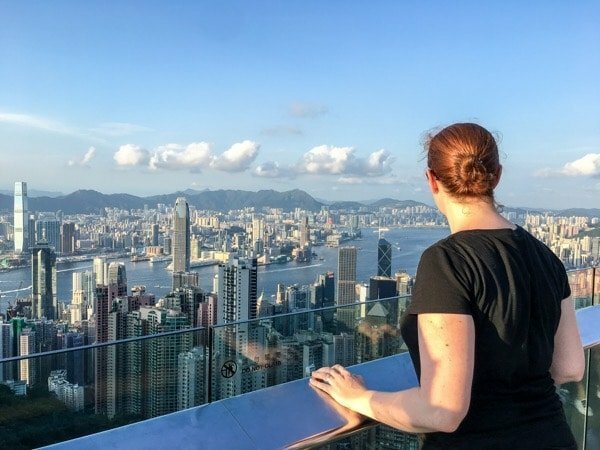 Check out this list of the top 18 things to do with kids in Hong Kong by La Jolla Mom, a blog that I’ve come across a few times now when searching for travel planning tips with the toddler in tow for a number of destinations. The writer was previously an expat in Hong Kong having lived their with her own kids and I’ve always found her articles helpful and thorough.